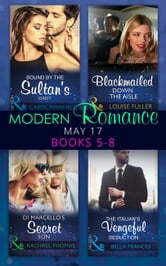 Four of the newest modern romances in one place! Bound by the Sultan’s Baby by Carol Marinelli A scandalous royal consequence! One night with innocent wedding planner Gabi was not enough for Sultan Alim al-Lehan, but duty called him home. Memories of their forbidden pleasure prove impossible to forget–especially when he discovers Gabi has just returned from maternity leave! The baby must be his, but if Gabi won't tell him, Alim will seduce the truth out of her! Commanding that she arrange his wedding, even if he's not yet picked a wife, is the ideal ruse. Alim wants her in his bed, but must decide–as a sultan's mistress or bride! Blackmailed Down the Aisle by Louise Fuller "What's it to be–me, or the police?" Out-of-work actress Daisy Maddox would do anything for her brother–even sneak into a sleek New York office to return the watch he stole from billionaire Rollo Fleming. When Rollo catches her red-handed, Daisy is completely at his mercy. But Rollo needs a wife to seal a deal, and events take a wild turn–he demands Daisy become his temporary wife! Swept into Rollo's world, Daisy's caught in an intense tangle of emotions. And with every searing kiss, Daisy's guard melts, as she discovers there are unexpected, pleasurable advantages to being blackmailed down the aisle… Di Marcello’s Secret Son by Rachael Thomas The challenge: to leave your billionaire lifestyle behind for two weeks… Italian tycoon Antonio Di Marcello relishes a challenge–but running into Sadie Parker while undercover as a mechanic rocks him to the core. Four years after their fevered fling stripped away his iron guard, he's confronted with the shocking consequences… Sadie gave up hope on her desperate attempts to contact Antonio. Now she has to face the day she's both dreaded and longed for! Yet Antonio's claim over her and her son is hard to resist–especially because he'll use a sensual onslaught to get what he wants! The Italian’s Vengeful Seduction by Bella Francis His tantalizing revenge! Tycoon Marco Borsatto gave Stacey Jackson her first taste of pleasure…only to devastate her with accusations of treachery. Ever since, waitress Stacey has buried any hint of vulnerability behind a cool facade–she refuses to open herself up to hurt again. Except Marco isn't a man to forgive and forget! When he rescues Stacey from another man, one look at Stacey's luscious form is enough to remind him of her bitter betrayal–and their electrifying magnetism! Marco won't allow Stacey to slip through his fingers again: his touch will be his vengeance!